Take control of 10 instruments sampled in precise detail, intuitively playable, and arranged for realistic performance into sections of up to six pieces. A 30 GB library delivers supreme depth and flexibility with added velocity layers and articulations. And intelligent auto-arranging gives you true-to-life horn arrangements no matter your skill level. 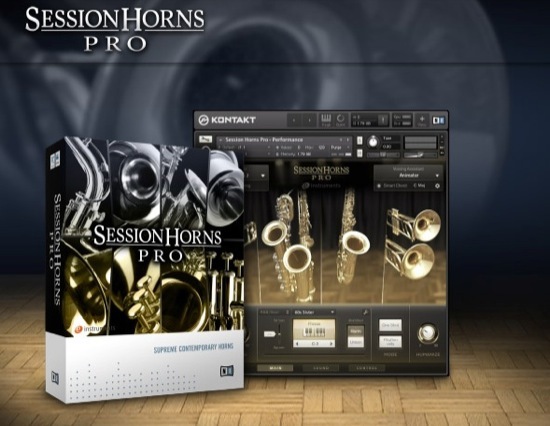 Session Horns Pro gives you three saxophones, two trombones, three trumpets, tuba, and flugelhorn. 38 pre-arranged section presets for all popular styles get you started right. Or customize your horn section with up to six instruments split into four voices. You can also play each instrument solo with ultimate realism. Session Horns Pro runs in KONTAKT 5 and the free KONTAKT PLAYER, and is available at the NI Online Shop for £249.00.